Thirty-One has always been one of my favorite direct sales companies because their products are so practical. I have the Large Utility Tote in each of our cars to keep the trunk clutter to a minimum, the Littles Carry-All Caddy hanging at my back door to hold sunscreen, bug spray and sunglasses and I always travel with my Flat Iron Case and Rolling Tote! When I found out that my good friend Vickie became a consultant for Thirty-One I was so excited. Now I had an excuse to tell the hubby about why I'm always buying awesome bags to stay organized- you have to support your friends, right? Here is what Vickie had to say about Thirty-One including a special offer for Redhead in Raleigh readers! First, tell us a little bit about yourself! I am married to my college sweetheart & we will be celebrating our 17th wedding anniversary next month (23 years together!) We have three girls ages 5, 7 & 9. After working for almost 15 years as a critical care nurse, we decided I would stay home about 5 years ago to become the chief executive officer of our crazy home! How did you first get involved with Thirty-One? I was first introduced to 31 at a party I hosted for a friend of mine. After about one year of using the products, my friend suggested I become a consultant & I did! What is your favorite part about Thirty-One? I love the product! The company is very supportive & encourages & celebrates women, but I would have to say my favorite part is the products. What is your favorite part about being a consultant for Thirty-One? For where we are in our life right now, I love the flexibility of the schedule (I decide), extra income & going to parties & meeting awesome woman! 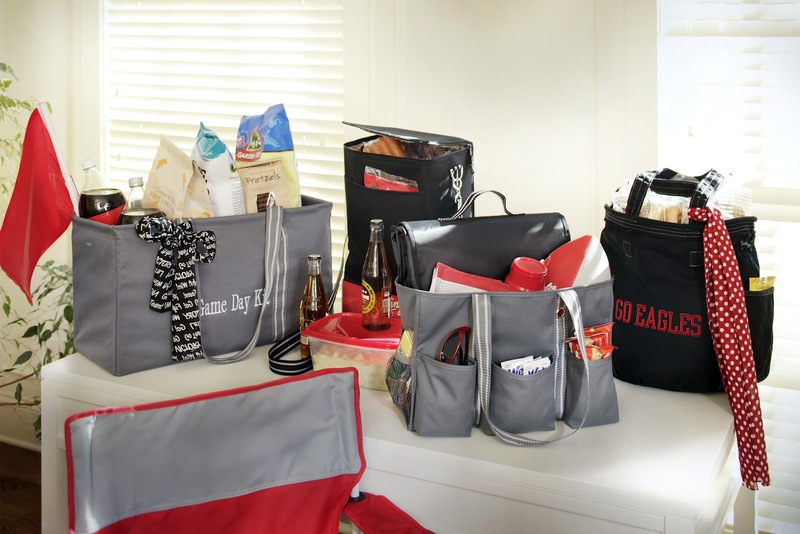 The large utility totes & zipper pouches....hands down! Here's your chance for a shameless plug! We always have terrific monthly specials for both customers and hosts. For any of Redhead in Raleigh reader who books a party with me, I will give you the choice of a complimentary zipper pouch! You can order on my website (Mythirtyone.com/vickietakei/), at a party, email (QVtakei@yahoo.com) or call me (9196093834) and I can answer questions & take your order as well. Check out the Advertising page if you want to be cool like Vickie and sponsor Redhead in Raleigh.